Chamilia's extensive range of stunning beads allow you to form bespoke jewellery exclusive to you or a loved one. 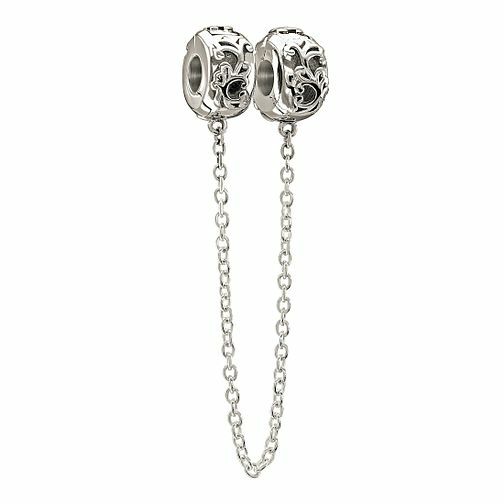 These two beautifully crafted filigree beads made from sterling silver are bound together by a chain, perfect for securing on each end of your bracelet to prevent the beads coming off should your bracelet come undone. Chamilia sterling silver filigree safety chain is rated 4.0 out of 5 by 4. Rated 4 out of 5 by Anonymous from Good security. This item makes me feel secure when wearing my bracelet, as even if it came undone I wouldn't lose any charms or bracelet. However, it is very fiddly to fit, even assistant in jewellers couldn't do it. I eventually did manage. Rated 2 out of 5 by Anonymous from Go in to a store to try before you buy! Does not fit either of my bracelets so had to return it.